The demographics of our clients are such that just about all of them have busy schedules that take up a lot of time. In fact, this is why many of them consider mediation in place of a traditional courtroom divorce in the first place – they don’t want to invest a huge amount of time in a contentious, unpleasant process. At Split Simple, we understand the value of your time, and we work accordingly. Our attorney-mediators will work as hard as possible to find a time for your mediation sessions that fits with your busy schedules. 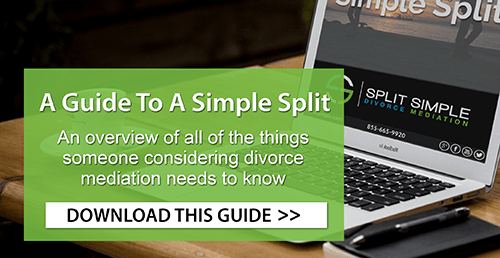 If you’re considering mediated divorce and you’re looking for a company that understands the complexities of your day-to-day life, please call Split Simple today at (855) 665-9920 or contact us online for Chicago divorce mediation. Our uncontested divorce process begins in the simplest of ways – with a phone call. One spouse calls us and talks to us for a bit about Split Simple and how we might be able to help. If that conversation proves to be a productive one, your mediator will talk by phone to your spouse so that he/she understands the process and pricing. Following that conversation, we then begin the process of scheduling your first mediation session. These sessions typically last around two hours, and most couples need one or two sessions to work through all of the relevant issues. That’s not set in stone, obviously, and every situation is unique. We understand that finding two hours in the middle of the day can be difficult. That’s why we offer after hours appointments and will send both parties a list of dates and times that work for our attorney-mediators. Because we effectively “represent” both parties in the divorce and not just one or the other, we will ensure that the time we find is convenient for everyone involved. Furthermore, we have multiple locations, ensuring that there is likely a convenient office near you. And if there isn’t a location that works for you, remote mediation is an option – we can conduct a mediation session through video-conferencing and screen sharing technology. We know that the logistics can seem a little daunting. We’re committed to working through all of the practical issues with you and your spouse so that everyone can sit together in a room and find a solution that is right for you and your family. If you’re considering a divorce and you want to eliminate the cost and time commitment of a traditional courtroom divorce, please call us today at (855) 665-9920 or contact us online Chicago divorce mediation.